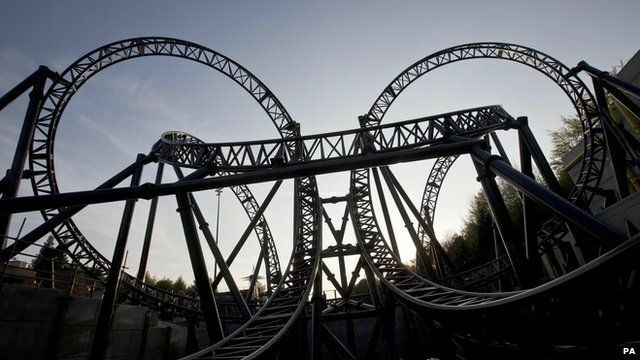 'Human error' caused Smiler crash Jump to media player Human error caused the Alton Towers rollercoaster crash in June that seriously injured five people, the Staffordshire theme park said. Smiler victim 'feared she would die' Jump to media player One of the victims of the Alton Towers rollercoaster crash has told the BBC that she thought she was going to die. Alton Towers Smiler ride in action Jump to media player Archive footage of the Smiler rollercoaster in action, as four people are seriously injured on the ride at Alton Towers in Staffordshire. Smiler crash: Mobile phone footage Jump to media player Mobile phone footage shows the Smiler ride at Alton Towers immediately after a crash that seriously injured four people. Alton Towers victim 'fighting to save leg' Jump to media player One of the victims of the Alton Towers Smiler rollercoaster crash is battling to avoid amputation of her leg, her lawyer has told the BBC. Smiler rescue 'most challenging' Jump to media player The rescue of 16 people stuck on Alton Towers' Smiler rollercoaster after it crashed was "the most challenging operation" ever carried out by fire crews called to the scene. Human error caused the Alton Towers rollercoaster crash in June that seriously injured five people, the Staffordshire theme park said. Two women - Victoria Balch and Leah Washington - needed leg amputations after the Smiler ride hit an empty carriage in front of it on 2 June. Staff misunderstood a shutdown message and wrongly restarted the ride, an investigation by the park confirmed. No technical or mechanical issues were found with the ride itself.